MP SPEAKS On Saturday, during a forum entitled ‘Private Higher Education - Avoiding a Hidden Crisis’ organised by the Penang Institute in Kuala Lumpur, the authors of the report of the same title presented some very worrying findings. The authors looked at the financial statements of the 41 private universities, the 27 university colleges and the eight foreign branch university campuses in Malaysia for the year 2013 and discovered the following. The overall numbers for the private higher education sector in Malaysia shows a general state of positive financial health - they have assets of RM10.1 billion versus liabilities of RM6.2 billion; they have overall reserves of RM3.9 billion; revenues were RM4.2 billion in 2013 and profits before tax were RM206.5 million; dividends of RM225.7 million were paid to shareholders. But when the distribution of these figures are examined, the state of the financial health of many of these private higher learning institutions (HLIs) are called into question. Approximately 46 percent of these private HLIs have insufficient assets to cover their current liabilities. More than 71 percent of these private HLIs fail to hold twice as much current assets compared to current liabilities as protection to cover risk. And 64 percent of private these HLIs have debts - which are mostly short term - exceeding their paid up capital. There are approximately 120,000 students in these ‘financially distressed’ private HLIs. Around 46 percent of all universities and 43 percent of all HLIs made losses before tax in 2013. These numbers rise to 50 percent and 46 percent respectively when profits after tax figures are used. We know that the amount of National Higher Education Fund Corporation (PTPTN) loans per student were cut by 5 percent for public universities and 15 percent for private universities in November 2014. PTPTN loans account for around 70 percent of the income of private HLIs. When the researchers projected a 15 percent cut in 70 percent of the revenue (which translates into a 10.5 percent cut in overall revenue), it was found that approximately 70 percent of private HLIs would be making losses. The number of students in these affected private HLIs would increase from 120,000 to 215,000. The reason that so many of these private HLIs are not making profits is not because they are ‘not-for-profit’. In fact, 86 percent of private HLIs are ‘for-profit’ companies with the remaining 14 percent being ‘not-for-profit’. The problem with these loss making private HLIs is not that they are ‘not-for-profit’ but rather, they cannot put themselves in a position to make profits, for a variety of reasons. One of the possible reasons put forth by the researchers is that the vice-chancellors of these universities - half of whom are in their 60s and are mostly male - do not have enough commercial experience to run these universities in a profitable manner. Many of the VCs and DVCs are brought in from the public sector where budgets which are allocated by the Education Ministry have to be spent as part of their respective key performance indicators (KPIs). Whereas in the private sector, budgets have to be justified vis-à-vis the revenue which is brought in via student enrolment which is getting more and more competitive as the number of private HLIs grow. Another possible reason given is that VCs who are foreigners may not have such a clear understanding of the local private higher education sector and thus, less likely to be able to manage private HLIs in a profitable manner. To back up this argument, the researchers found that 78 percent of private HLIs run by foreigners are in some form of financial distress. 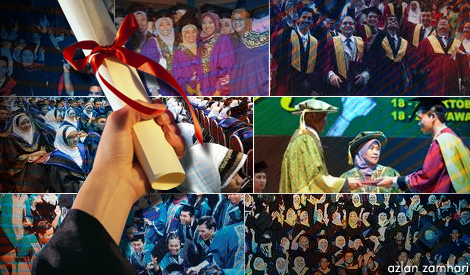 The researchers also not the smaller percentage of academics with PhD qualifications in the private HLIs (13.3 percent in 2013) compared to the public universities (36.4 percent in 2013). In additional, 10.5 percent of academics in private HLIs had below a Bachelor’s level qualification. The researchers argue that lower qualifications are associated with lower salaries, part-time appointments, short-term contracts and piece work as well as low levels of research in the private HLIs. c. Problem of ‘at-risk’ universities whose asset valuation is zero or even negative. No one wants to take over or merge with these institutions. c. Can take the form of vertical integration involving schools, colleges and universities. c. Formal governance structures based on international best practice. c. Clear improvement KPIs and licence removal penalties. d. Wider support from a new ‘HE Fund’ for direct funding. c. ‘Takeover’ through incentivised refinancing programmes. d. Driven by development corridors or state governments. c. Shared admissions is an ‘UCAS-style. clearing system. This presentation will be uploaded to the website of Penang Institute shortly and we sincerely hope that the Education Ministers I and II - Muhyiddin Yassin and Idris Jusoh - as well as the senior officials in the Education Ministry can take these research findings seriously and consider implementing some of the recommendations put forward. The number of students in private HLIs is projected to significantly outnumber those in public universities by 2025 according Malaysian Education Blueprint 2015-2025 Higher Education (867,000 in private HLIs compared to 764,000 in public universities by 2025). If the problems faced by the private HLIs are not addressed, they could build up to a crisis that would affect hundreds of thousands of students. The warning signs are already here. The Allianz University College of Medical Sciences closed at the end of 2014 with a reallocation of more than 2000 students and loss of around 500 staff. Al-Bukari International University had announced in January 2014 that it would close in June 2014 with arrangements to reallocate around 600 students to other IPTS. This was later withdrawn and a new collaboration model was announced. Masterskill Education Group Berhad, owner of Asia Metropolitan University, saw its share price fall from RM4.24 in August 2010 to a low of RM0.30 in May 2014 and RM0.68 in April 2015. Changes in shareholders and management have been announced recently. We sincerely hope that the Education Ministry will take note of the problems raised by our researchers before it’s too late. ONG KIAN MING is the MP for Serdang and general manager of the Penang Institute. The researchers for this project are DR GEOFFREY WILLIAMS and DR PAUL LIM.